News in from Mark Duncan at Yachting Partners International that Russell Crump has listed for sale the 26m motor yacht Wedge Three. Built by Riva to RINA class, she was launched in 2007 as one of the yard's Opera series and has been immaculately maintained since new by her original owner. An elegant, contemporary interior by Mauro Micheli provides accommodation for eight guests in four staterooms plus three crew. The master suite is particularly impressive, flooded with light from large windows, and there is also a VIP stateroom and two twin cabins. All staterooms have full en suite bathroom facilities. 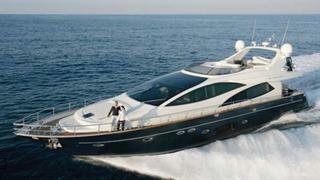 Twin 2,000hp MTU engines give her a cruising speed of 28 knots and a top speed of 33.5 knots. Lying in Monaco, Wedge Three is asking €2.9 million with VAT paid.